Angel Piccirillo defended her PIAA Class AA cross country title last Saturday in Hershey with a state-meet record time of 18 minutes, 31 seconds. The Homer-Center phenom does not see states as the end but only the beginning of more to accomplish in her senior year. Regionals are two weeks away on Long Island, and nationals are two weeks after that. Then there are the coming winter indoor and spring track and field seasons before she sets off to Villanova to honor the commitment she made to that program. Piccirillo's accomplishments in her sport are many and impressive, yet her achievements as an active member of her school, a humanitarian and as a role model for underclassmen are just as important. Last year, as a junior, she was selected from thousands of athletes to be the 2009-2010 Gatorade Pennsylvania Girls Cross Country Runner of the Year. That honor recognized her "A" grade average, her fund-raising work for Haitian disaster relief, her church mission trip to give aid in Mississippi, and her many medals as a legitimate high school track star. In all, she accumulated six state titles in less than two years. Thanks to Saturday's win, she holds two PIAA titles in cross country. She also has two PIAA outdoor championships in the 1,600-meter run and two indoor state titles through Pennsylvania's Track and Field Coaches Association. 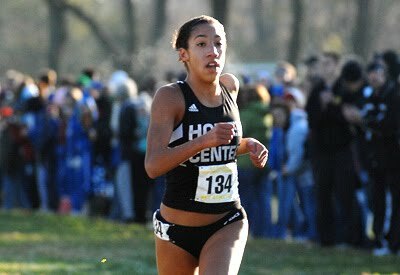 In 2010, she was the Foot Locker Northeast Region's sixth-place finisher, and she placed 32nd in the national championship. She was 2010's Paul Short Run individual runner up, and she won the 1,600-meter race in the esteemed Penns Relay held in Philadelphia. In fact, she is one of six girls in the 117-year history of that event to seize the title twice. Although Piccirillo is suited perfectly for the physical demands of cross country, the sport was not her first choice. She took up the sport and dedicated herself as a freshman with prompting from an older friend, Alyssa Taddie. When she qualified for states and nearly won, despite training for her first love, volleyball, Piccirillo realized that cross country and track and field was for her. "Giving up volleyball and focusing 100 percent was one of the hardest decisions that I ever had to make," she explained. Her dad, Bob, understood her dilemma. "Where do you see cross country? It's not like they have it on TV or anything. It is a grueling sport, vigorous training on a daily basis, which she has to do. "Locally, she has been receiving a lot of well-deserved attention, and she's given some visibility to the sport as a legitimate choice. Hopefully, other girls may see the opportunities that opened up for Ang and see cross country as a credible choice, not just a sport to fall back on or to use to train for basketball or volleyball." Both Piccirillos admit that the decision ultimately was a "no-brainer. It was by default, really," her father said. "The sport chose her." However the choice was made, her coach, Michael Gentile, has only one word to characterize Piccirillo as a student-athlete: "driven". "Her dedication and commitment to excellence as an athlete is only surpassed by her dedication and commitment in the classroom," Gentile said. "She doesn't settle for second best in any area. I honestly don't know how she does it, but it is exactly that type of wiring that makes her successful." As an academic leader, Piccirillo is the vice president of the school's National Honor Society and of her senior class. She is involved in the student council, the Future Business Leaders of America, the Spanish Club and Varsity Club. Gentile explained that coaching such a rare talent requires a commitment to reciprocate hers. The coach and athlete carefully picked the meets she would participate in, and this didn't always include Heritage Conference meets. Her coach explained, "I have Angel travel around for her competitions, so as to do the best by her. To give her the exposure that she needs and to provide her with the challenges that she needs to improve." Piccirillo's dedication has come with some sacrifices. Absorbed in academic and extra-curricular activities at school, she has very little time to slow down and enjoy the social aspects of her senior year. Courted by schools in Tennessee, Virginia, Kentucky and elsewhere, Piccirillo's fall schedule was consumed by tours and meets. Now that she is committed to Villanova to study biology, she is eager to get back to training without distraction. To that end, Gentile has been boosting and altering her workouts to maximize her potential. "In the past I would cut Angel's miles once the season started. This season it just didn't happen and she responded well, so we just went with it," he said. "We added some different types of tempo runs, repeats and intervals. "Also, we changed her race strategy. I tried to make her a more balanced and intelligent racer. We tried to keep those race splits even throughout the race, instead of going out hard and fading in the end. We stayed mostly local this year, too. We only traveled east once. We stayed close so she could be more rested and work on things closer to home." So far, the strategy has paid off, and the trust between coach and athlete has been strengthened. "Everything's that he's told me has been true," Piccirillo said. "I don't have to worry about doubting his decision because I trust him 110 percent. He's always been honest, up front, and really real, and that's what you need in a coach." There are many things Gentile likes about the athlete, including her work ethic and her coachability, among others. But, perhaps above all, it is her personality. He said, "A friend said to me just last week, 'The best part of what Angel is, is not her athletic ability.' I wish I would have come up with that. It describes her essence perfectly. She has a charismatic personality. People are drawn to her. No matter where we go, people are always approaching her, and she has become very social in that way."